Although severely damaged, this folio gives us a glimpse of the unique quality of the codex that once comprised it. 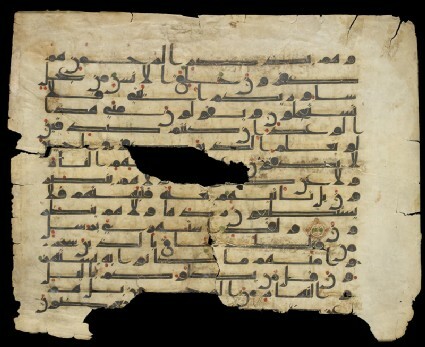 The style in which it is written, characterized by a marked horizontal stretch in some letters (mashq), is one the most elegant renderings of kufic script, the angular style used for copying Qur'ans in the first centuries of Islam. The script on this page possesses a range of archaic features that have led scholars to associate the manuscript with an early date. This idea is also reinforced by the likelihood that the vowels and diacritical marks, which look rather inconsistent and irregular when compared to the disciplined and balanced execution of the consonants, were added at a later date. Bequeathed by Ralph Pinder-Wilson, 2009.